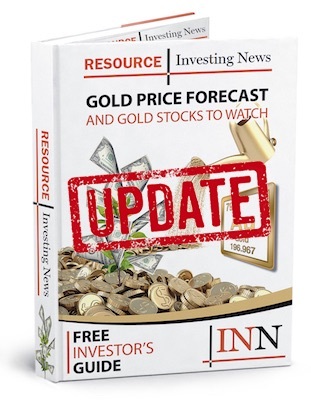 Execs from McEwen Mining, Angkor Gold, Commander Resources, Golden Predator, Great Bear Resources, Newrange Gold, Osprey Gold and Parallel Mining share their gold forecast for 2019. The gold price has decreased almost 5 percent this year, a contrast to what was predicted at the end of 2017. Several key factors such as geopolitical tensions, a US dollar that consistently rallied throughout the year and ongoing interest rate hikes from the US Federal Reserve have all impacted gold in the past year. To learn more about what companies see coming in 2019, the Investing News Network reached out to executives and CEOs in the space for their gold forecast. We received insight from Stephen Burega, CEO of Angkor Gold (TSXV:ANK); Robert Cameron, president and CEO of Commander Resources (TSXV:CMD); Janet Lee-Sheriff, CEO of Golden Predator Mining (TSXV:GPY); Chris Taylor, CEO of Great Bear Resources (TSXV:GBR); Rob McEwen, chairman and chief owner of McEwen Mining (TSX:MUX,NYSE:MUX); Robert Carrington, CEO of Newrange Gold (TSXV:NRG); Cooper Quinn, president and director of Osprey Gold (TSXV:OS); and John Anderson, CEO and director of Parallel Mining (TSXV:PAL). This time last year, analysts and companies were predicting a strong year for gold. Many market watchers expected the yellow metal to rise on the back of geopolitical concerns and economic volatility. The safe-haven nature of the precious metal was expected to shine through. At the beginning of 2018, Parallel’s Anderson believed that the metal would rise. “We expected more consolidation in the industry and an upward movement in gold to US$1,300,” he commented. Due to this unpredictability, the yellow metal was not the safe-haven that industry insiders expected it to be. The strong US dollar became the more stable and promising option for investors. For the most part, there was consensus among the execs that the most challenging aspect of the resource sector in 2018 was a lack of confidence and interest from investors. Looking at what’s ahead for gold, Great Bear’s Taylor “expects a better gold market” for 2019. Similarly, Commander’s Cameron believes that next year will be a “take-back” year for the precious metals. “2019 [will] win back some of the investors we have lost to other sectors over the last eight years,” he said. Angkor’s Burega agrees that the upcoming year will bring a shift away from sectors such as cannabis, cryptocurrencies and lithium, resulting in a circle back to the yellow metal. “We feel that as those overheated markets cool down in 2019, many investors will return to the basics, including gold and other commodities,” he noted. Similarly, Osprey’s Quinn believes that investors will start to move their attention back to the precious metals as the 2019 landscape develops. “[Investors will be] looking to diversify a little bit here, back into a growth sector, and some of them are traditionally riding a gold-focused investment. Then new people … younger investors who are looking to diversify out of just … one or two sectors that they might be involved in, [are] looking to get involved in the commodity space,” he said. Parallel’s Anderson also sees the price of gold rising, stating that 2019 should hold “much better gold price and investor awareness.” Anderson added that the yellow metal will start moving once the Fed’s interest rate hikes come to an end. Meanwhile, Golden Predator’s Lee-Sheriff suggested that investors who are new to the market should not solely focus on a company for its spending and drilling. “Look for juniors who are not just drilling and spending, and look at management’s investment and G&A (general and administrative expenses). Look for mergers and acquisitions and revenue potential. There needs to be an alternate model for companies other than going back to the markets every year. Find those companies. All boats won’t float higher,” she explained. The execs also took the time to share company highlights from 2018 and outline what catalysts they have to look forward to in the coming year. In 2018, Golden Predator poured a gold bar and next year it will process a 7,000-tonne bulk sample. For Great Bear, this year held three back-to-back high-grade gold discoveries at its Dixie property in Canada’s Red Lake district, which took the company from a market capitalization of approximately US$1 million to about US$4 million. “We are a tightly held stock and increased in value from about US$0.50 to more than US$2 at that time, which prompted Rob McEwen to invest US$6 million in a US$10-million financing at US$1.45, which closed shortly thereafter,” said Taylor. In 2019, the company plans to continue on with multiple drill programs, with Taylor noting that these will not require any funding to complete the work. “Shareholders can look forward to plenty of news flow throughout 2019 as we further define the high-grade zones in what could become the next significant new discovery in Red Lake,” added Taylor. The most significant development for Commander was the completion of a major financing on the back of a restructuring. “With a strong treasury we embarked on a broad program of property work designed to elevate the prospectivity of our projects with an aim to attract potential partners. More importantly, we began several project-generation initiatives to replenish the project pipeline,” stated Cameron. Going forward, Commander will continue with planned exploration for many of its projects in 2019, and hopes to conclude several joint ventures and partnerships. Anderson explained that Parallel Mining saw its exploration thesis confirmed in 2018 with a positive response from the markets. Lastly, McEwen Mining is expecting a resource update from its Gold Bar project in Nevada and will be making updates to its open-pit mine. “Our gold mine was an open pit and we’re looking at filling the pit with tailings. We’ll be mining the deposit, and that would run for 12 years and be generating attractive returns even at today’s prices,” McEwen revealed. Editorial Disclosure: Angkor Gold, Commander Resources, Golden Predator, Great Bear Resources, Newrange Gold and Parallel Mining are clients of the Investing News Network. This article is not paid-for content.